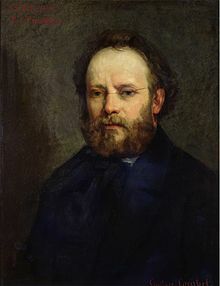 Pierre-Joseph Proudhon (French: [pjɛʁ ʒɔzɛf pʁudɔ̃]; 15 Januar 1809 – 19 Januar 1865) wis a French politeecian an the foonder o mutualist philosofie. He wis the first person tae declare himsel an anarchist an is widely regairdit as ane o the ideology's maist influential theorists. Proudhon is even considert bi mony tae be the "faither o anarchism". ↑ The "dual pouer" wis first uised bi Vladimir Lenin, but it wis conceptually first ootlined bi Proudhon—Murray Bookchin, The Third Revolution: Popular Movements in the Revolutionary Era, Volume 2, A&C Black, 1996, p. 115: "Proudhon made the bright suggestion, in his periodical Le Représentant du peuple (April 28, 1848), that the mass democracy o the clubs could acome a popular forum whaur the social agenda o the revolution coud be prepared for uise bi the Constituent Assembly—a proponal that would essentially hae defused the potency o the clubs as a potentially rebellious dual pouer." ↑ Leier, Mark (2006). Bakunin: The Creative Passion. Seven Stories Press. p. 211. ISBN 978-1-58322-894-4. ↑ Daniel Guerin, Anarchism: From Theory to Practice (New York: Monthly Review Press, 1970). This page wis last eeditit on 26 Mairch 2018, at 18:42.